Perma Crackfill or Concrete Repair Mortar is a specially formulated repair mortar designed to fully meet the requirement of effectively repairing cracks in plasters and in concrete, avoiding the use of costly sealants and putties. Concrete Repair Mortar or Perma Crackfill is a dry powder when mixed with water it forms a creamy consistency paste which is ready for use in repairing cracks and repairing plasters. Concrete Repair Mortar or Perma Crackfill is reinforced with alkali resistant fibers. 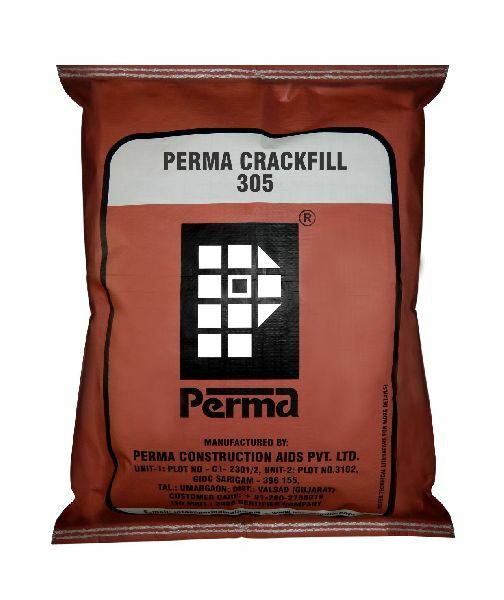 perma crackfill is available in grey and off white colour powder. Perma Crack fill replaces costly sealant and putties. It is non shrink, hence possibility of shrinkage cracks are non existent. It has high tensile strength and good adhesion property. The finish achieved is sufficiently smooth. Good resistance to freeze / thaw cycles, carbonation and attack by chlorides. Conventional curing is not required.